AC Transit prohibits travel to N.C. The agency said that N.C.'s so-called "bathroom law" is in direct conflict with its longstanding commitment of access and inclusion to all members of its community. The Roadeo reinforces safe-driving habits and operator professionalism behind the wheel. 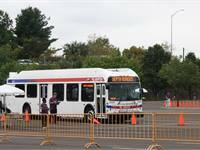 In total, 18 public transit agencies and 48 drivers competed for points on a written exam, an obstacle course, assisting a passenger with wheelchair securements and a pre-trip vehicle inspection. Event held in conjunction with Bus and Paratransit Conference in Long Beach, Calif.
One of the highlights of the year for SEPTA bus operators and mechanics is the agency’s annual Bus Roadeo, where employees showcase their driving, safety and maintenance skills in front of family, friends and colleagues in a festive atmosphere. But the Roadeo offers more than just bragging rights and accolades for participants.